In this cult comedy classic, Michael Bluth is forced to run the family business in Orange County after his father is sent to jail for committing a white-collar crime. He struggles with balancing the demands of his bizarre, dysfunctional, and spoiled family while trying to maintain a positive role model image for his teenage son, George Michael. The massive cult following enabled its return after being canceled following the third season. High school chemistry instructor Walter White learns that he has terminal lung cancer. When he realizes that his disease could leave his family with nothing, he decides to team up with a former student to try and make some extra money. Together they turn an old RV into a portable crystal meth lab. This show has become such a cult classic that you can even get Breaking Bad action figures. The survivors of an airplane crash are stranded on a seemingly deserted and mysterious island. Each person conceals a secret and as the series progresses we learn that the island is constructed of a security system complete with underground bunkers and violent shadow-figures threatening their survival. As special agents for the FBI, Fox Mulder and Dana Scully investigate unexplained cases referred to as the X-Files. The government attempts to convince them that everything they uncover is a lie, but they stop at nothing to prove the tagline of the show: the truth is out there. This British science fiction TV program first aired in 1963 and is a significant part of British pop culture. Elsewhere it quickly emerged as a cult TV favorite. Over the seasons, different actors have headlined as the Doctor, who escaped from the planet Gallifrey in a stolen time machine. The transition is intelligently written into the plot because the Doctor can take on a new appearance and personality when his body is fatally wounded. What is the next cult TV show that will attract a fanatical following? The answer depends on both casual and devoted fans who want to depart from mainstream TV. The size of the audience is insignificant. However, loyalty and commitment are essential factors for the next unofficial cult TV show to earn its place in the ranks. I totally loved Breaking Bad! I am guessing that Walking Dead will be the next to earn its place in the ranks. Yes! I totally agree, Walking Dead will be a cult classic! No “Friends”???? I’m mad about “Friends”. I have not watched any from your list. I loved Lost but couldn’t keep up with the missed episodes after a few months! And I totally agree with Veronica Lee with The Walking Dead! I absolutely love that show! It’s a must watch for sure! X-files is/was one of my all time favorites. I would add; Firefly and The Killing. Both great shows. Off the air too soon! Oh yes on Firefly, there is so much fanfare around the only season of the show! We actually just introduced our daughter to it on Netflix over the Christmas break when she was home from college. I loved all those shows. I cried when Lost ended. I cry each time the Dr regenerates. The only one of these I’ve watched is the X-files and I loved it. I’m like the rest of you, Walking Dead will be next. We watched all of X-Files and Lost, and we’ve watched some of Dr. Who. I think we lost the channel for a while or something because I don’t know why else we would have stopped watching! I agree that Walking Dead is likely another ‘cult’ TV show (which we also happen to watch). I would almost say so was Star Trek, considering the original series didn’t last that many seasons, but then look at how many movies and other shows it spun off! Although I have never watched these shows, my entire family loved Lost. I binge watched Breaking Bad and loved it! My son and husband are BIG Breaking Bad fans and years ago I loved watching X-files. My son was into Lost but I lost interest after a couple of episodes. I never got into the other two but I think Twin Peaks should of been on the list just because, even after 25 years there is still a big cult following. I remember growing up watching the X-files! And the Twilight Zone! I was just in New MExico where Breaking Bad was filmed and it was pretty cool. I think Walking Dead should be on your next list, but honestly Supernatural has been going for almost 10 years and there are thousands of fans like me who have been watching from the start as well as many new fans along the way. Cult? Maybe not? Loyal fandom? Most definitely! Lost was a favorite of mine. I watched every episode. I am now starting to watch all the episodes of Breaking Bad. Lost is one of my all-time favorite shows. I watched it each week, but have rewatched the entire series multiple times. 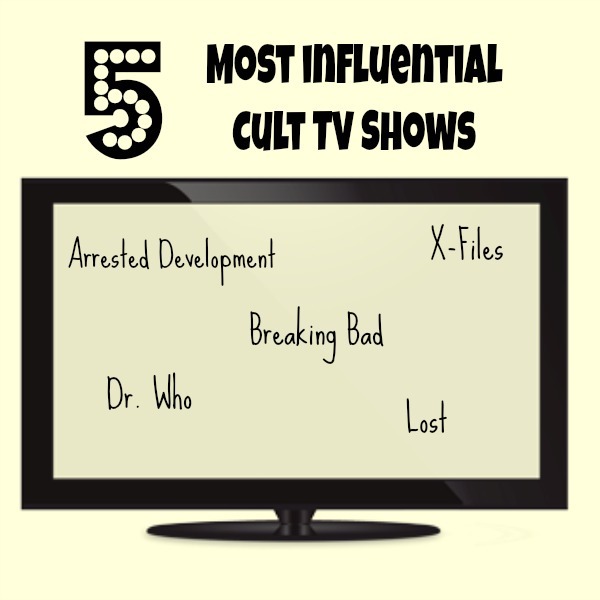 I knew of all of these TV shows, though the X files was the only show that I watched when it was on TV. Yes, I think that show helped to bring similar shows on to the screen, just like the other shows that you have listed have done so. Can you believe, I’ve never seen any of these shows. I’m going to do better in 2015. I’ve only seen the X-files but I’ve heard of the other but I just haven’t seen them before. Buffy the Vampire Slayer and My So Called life should totally be on that list. Oh, I loved My So-Called Life. Jordan Catalano was my imaginary high school boyfriend. I agree with and watched all the shows on your list. I also watched Firefly and The. Walking Dead. Two others should be added and both starred Timothy Olyphant,Deadwood and Justified. Redwood was on HBO and ended years ago, but you can still watch it. The other one is Justified, but this is the last season. Also, Sons ofAnarchy was a great one and Netflix has 6 seasons on now. I believe Supernaturalreal is a cult show. With a huge following. Revolution h ad the potential to have a cu l t following, but was cancelled. The only one of these I’ve seen is Lost and I loved the show until the end. I guess I just didn’t get it quite so much. Good list, surprised Pretty Little Liars didn’t make the cut though! Breaking Bad is the best show I’ve ever seen and I’ve watched a lot. OMG I loved Lost! It was one of the best shows Ever!! The only one I’ve watched is Breaking Bad and I’m nowhere near done with it. I think I’m on season two, but it’s awesome! I need to get going on this one also. I’m so far behind! So, I finally caught and episode of Breaking Bad and it was so good, I can’t wait to watch more. I used to be terrified of x files! love lost and breakin bad! I recently heard they are thinking of bringing back the X-Files, which was one of my favorites. I am also 7 episodes away from finishing the entire Breaking Bad series. My husband loved Breaking Bad from the first day it aired. I also remember Xfiles from when I was younger!